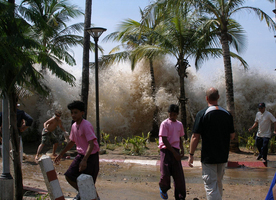 2 In December 2004, a giant tsunami crashed ashore in Indonesia, Sri Lanka, India, and Thailand. It was one of the deadliest natural disasters of all time, killing two hundred thousand people. 3 It began with an earthquake under the Indian Ocean. The huge earthquake had a magnitude of about 9.2. It occurred on the line where the Indian plate and the Burma plate met. Along that line, the Burma plate had been overriding the Indian plate, and forces had been building up for centuries. When it finally erupted into an earthquake, gigantic forces were released. 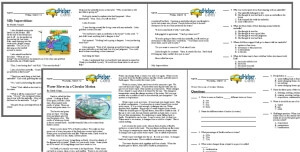 4 The earthquake triggered a series of massive tsunamis, which are also called tidal waves. The tsunamis didn't begin in just one spot, but in a long line where the two tectonic plates met.